Top Reggae songstress Etana invaded the United Kingdom last week to promote three hot singles from her yet to be titled sophomore release: "August Town," "Free" and "Happy Heart." On her highly anticipated visit, Etana was warmly greeted by fans and leading radio personalities. Just 24 hours after shooting the video for "Free" in Jamaica, Etana landed in UK and jump started an intense radio blitz. 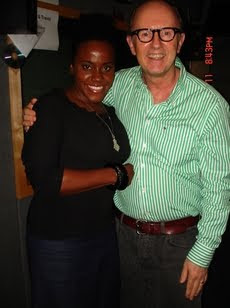 Etana's first interview was with none other than the legendary David Rodigan at London's famed Kiss FM, followed by an interview with BBC Radio 4. Etana was provided with the unique opportunity of reaching a very wide audience with her interview on BBC Radio 4, a mostly news-formatted (non-music) station that is considered BBC Radio's flagship. The station was extremely interested in interviewing Etana because of her crossover appeal. The soulful crooner also had a slew of memorable in-studio interviews with top radio jocks like Robo Ranx and Silver Star of BBC Radio 1xtra and Daddy Ernie of Choice FM. As Etana traveled from town to town, each area claimed a different Etana song that they loved. In addition to commercial radio stations, Etana visited and interviewed with over 20 pirate stations through out the UK. The demand to interview Etana was great, which ensured her UK experience was fully loaded. Much to Etana's credit, fans inundated the airwaves for a chance to talk with her. "The DJs were so surprised to see me hand delivering my new music," says Etana. "Most of them thought that we were here for a show.....no one believed that we were promoting new singles without having a show." "The Strong One's" latest singles perfectly display three distinct moods of her musical talent. "Happy Heart" is a gem of a love song and "Free" is an inspirational track, bursting with emotion. Meanwhile, on the other side of the spectrum, "August Town" addresses social issues surrounding Garrison communities. All three tracks are hard hitting and have been embraced in the UK. "We decided to push these three singles because Etana's next album will boast diversity," says Garfield "Chin" Bourne of Irish and Chin. "It will feature the best in Roots, Rock, Reggae and Dubwise. And an array of other music genre will be explored." Irish and Chin, Etana's management team, has set up a very intense promotional tour to further push Etana's new singles. Promotional efforts include videos for each single and heavy radio, tv and print media blitzes in key Reggae markets. Etana's next stop will be in St. Vincent and surrounding islands, followed by a U.S. run. Etana's groundbreaking debut Strong One (VP Records) was heralded by critics and fans alike, receiving several noteworthy accolades and awards. Based on the vibes from the latest music, there is no doubt that Etana's follow up effort will elevate her fresh brand of soul Reggae even higher.